… The library of which I spoke existed in a corner of the English Faculty Library at Cambridge, but it enabled hundreds of students to share all the relevant poets, painters, critics, musicians, and scientists of that time as a basis for an ongoing dialog. Would it not be possible to have similar libraries created by other departments in the university? Could not the History Department indicate those areas of anthropology and sociology that were indispensable to the most advanced historical studies of the hour? Could not the Department of Philosophy pool its awareness of many fields in order to create a composite image of all the relevant of many fields in order to create a composite image of all the relevant speculation and discovery of our time? Only now have I begun to realize that this unique library represented the meeting of both a written and oral tradition at an ancient university. It is this figure-ground pattern of the written and the oral that completes the meaning of the book and the library. It is as if there are two kinds of power at hand. Patrick Wilson’s Two Kinds of Power, published in 1968, and introduced in chapter 1, is a book that is often mentioned in library literature but whose message does not seem to have disseminated through library and cataloging thinking. If it had, our catalogs today might have a very different character. A professor of Library Science at the University of California at Berkeley, Wilson’s background was in philosophy, and his book took a distinctly philosophical approach to the question he posed, which most likely limited its effect on the practical world of librarianship. Because he approached his argument from all points of view, argued for and against, and did not derive any conclusions that could be implemented, there would need to be a rather long road from Wilson’s philosophy to actual cataloging code. Wilson takes up the question of the goals of what he calls “bibliography,” albeit applied to the bibliographical function of the library catalog. The message in the book, as I read it, is fairly straightforward once all of Wilson’s points and counterpoints are contemplated. He begins by stating something that seems obvious but is also generally missing from cataloging theory, which is that people read for a purpose, and that they come to the library looking for the best text (Wilson limits his argument to texts) for their purpose. This user need was not included in Cutter’s description of the catalog as an “efficient instrument.” By Wilson’s definition, Cutter (and the international principles that followed) dealt only with one catalog function: “bibliographic control.” Wilson suggests that in fact there are two such functions, which he calls “powers”: the first is the evaluatively neutral description of books, which was first defined by Cutter and is the role of descriptive cataloging, called “bibliographic control”; the second is the appraisal of texts, which facilitates the exploitation of the texts by the reader. This has traditionally been limited to the realm of scholarly bibliography or of “recommender” services. If one accepts Wilson’s statement that users wish to find the text that best suits their need, it would be hard to argue that libraries should not be trying to present the best texts to users. This, however, goes counter to the stated goal of the library catalog as that of bibliographic control, and when the topic of “best” is broached, one finds an element of neutrality fundamentalism that pervades some library thinking. This is of course irreconcilable with the fact that some of these same institutions pride themselves on their “readers’ services” that help readers find exactly the right book for them. The popularity of the readers’ advisory books of Nancy Pearl and social networks like Goodreads, where users share their evaluations of texts, show that there is a great interest on the part of library users and other readers to be pointed to “good books.” How users or reference librarians are supposed to identify the right books for them in a catalog that treats all resources neutrally is not addressed by cataloging theory. How users or reference librarians are supposed to identify the right books for them in a catalog that treats all resources neutrally is not addressed by cataloging theory. 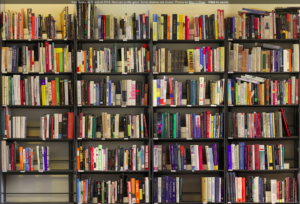 The content of a library, paradoxically is not its books but its users, as a recent study of the use of campus libraries by university faculty revealed. It was found that the dominant criterion for selection of a library was the geographical proximity of the library to the professor’s office. The depth of the collection in the researcher’s field was not as important a criterion as convenience (Dougherty & Blomquist, 1971, pp. 64-65). The researcher was able to convert the nearest library into a research facility that met his needs. In other words, the content of this conveniently located facility was its user. Any library can be converted from the facility it was designed to be, into the facility the user wishes it to become. A library designed for research can be used for entertainment, and vice-versa. As we move into greater use of electronic media, the user of the library will change even more. As the user changes, so will the library’s content or the use to which the content of the library will be subjected. In other words, as the ground in which the library exists changes, so will the figure of the library. The nineteenth-century notion of the library storing basically twentieth-century material will have to cope with the needs of twenty-first century users. After I published this piece I realized that I didn’t include what I think is a genre-defining example of McLuhan’s “Where it’s at” library: Bret Victor’s Bookshelf. This is the third part series called The Hashtag Syllabus. Part One is a brief examination of the recent phenomenon of generating and capturing crowdsourced syllabi on Twitter and Part Two is a technical description of how to use Zotero to collect and re-use bibliographies online.